The Mad Hatter Needs Your Help, Follow Him for Treasure! I'm really digging the social/viral marketing Disney is doing for Tim Burton's Alice in Wonderland. When the first trailer debuted in July, they used Facebook to build lots of early buzz. Now they're using Facebook again to debut another new series of posters (as far as we know). The Mad Hatter has posted a message on his fan page saying that if he gets 7500 "likes" on that message, he'll give us more "treasure." 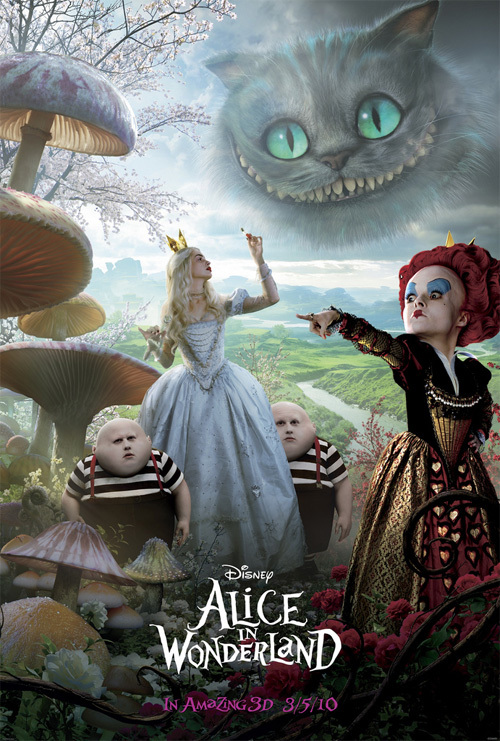 The first poster, seen below, reveals a good look at all the Alice in Wonderland characters, including the caterpillar (as it was leaked earlier this week). But of course, we're waiting for the full high res version! As of writing this, his message has over 4500 "likes", so he needs another 3000 and we'll next one. And of course he'll probably want way more to get the last poster, but I'm sure it'll be worth it. The buzz on this is still through the roof and people have been clamoring for new material, whether it be photos or posters or anything. I just hope they continue to use Facebook or continue to market the movie through viral means, since I love viral marketing and games like this. It's so fun! Anyway, be sure to become a fan of The Mad Hatter and follow us (as well as him) for new updates. "Interested in seeing even more? Spread the word!" I already "liked" it a few hours ago. C'mon people, "like" it! We all want those other pieces! This is the same photo that is in "Preview" magazine being given away at AMC theaters and which has already been posted on the internet with the other two parts attached. Fantastic, very nice Image for the movie. 7,500 Likes is a bit excessive, I think Disney is pushing their luck. If we get the 2nd part to a poster for that amount of likes then I am done. I don't even like Facebook so I shall be very happy to delete my acount. They should have used Myspace, Bebo, Youtube or even Twitter anything but Facebook.